Place the egg yolks and heavy cream in a metal or glass bowl set atop a pot of simmering water, not allowing the bottom of the bowl to touch the water. Whisk vigorously for 3-4 minutes or until the yolks are hot, the color has lightened and they have thickened. Slowly whisk in the melted butter and lemon juice and season to taste with cayenne pepper, salt and pepper. Remove from heat and set aside to keep warm while building the sandwich. (If the sauce gets too thick, you can always whisk in hot water, one tablespoon at a time to thin a bit. Place one half of a toasted bagel on one of four plates. Spread each with 1oz cream cheese. Then, divide the red onion among the sandwiches and then the sliced avocado. Top each with 3 slices of bacon, then top with the egg. 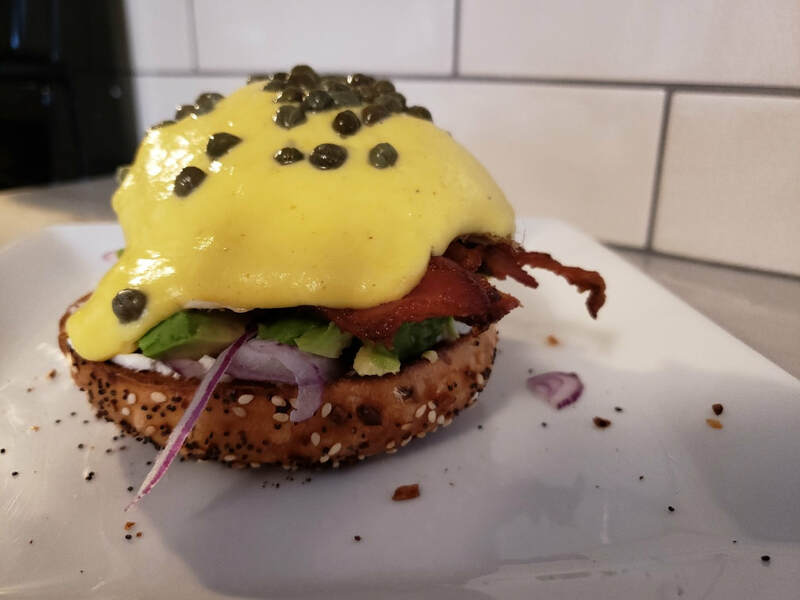 Drizzle the hollandaise over the top of the sandwich and garnish with the capers. You will need a knife and fork to conquer this one!